It's time for a new challenge at the DCRU DT Blog. Today's challenge is really fun. Who has leftover Valentine's paper? The challenge is to take that paper and turn it into a non-Valentine project. The DT got to play with My Mind's Eye "Be Loved" paper available at the DCRU Store. This was the first time I tried Unity Stamps and I'm already addicted. 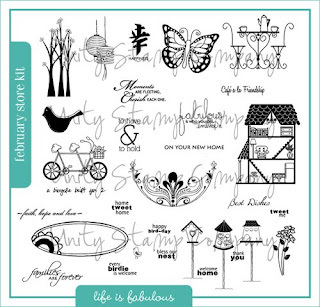 They are such high quality stamps, so easy to use and ink. For my card I also used Prism Cardstock, Copics, and Papertrey Ink Ribbon. I also used my trusty Martha Stewart Scallop Punch. 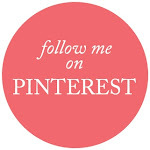 Visit the DCRU Blog and check out the DT's beautiful creations! This is just too cute Amber!! So, so , SO adorable! I love it! Luv what you did with the image. It works so well with the papers and the sentiment. Nice job! gorgeous card, Ber! I love this stamp set. Adorable card, Amber!! I love the fun image and great design!! 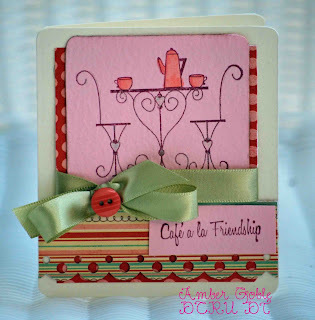 A True Friend Challenge 63 & Happy News!